Racing and the environment: an oxymoron? Not so much. The world of motorsports has a challenging task — reducing its ecological footprint and improving public perception. However, recent developments reveal that the industry might be getting on the right track. Motorsports is a $13.5 billion business, roughly on the same level as the National Football League. Beyond the sport’s wide appeal, it’s auto racing’s recent green initiatives that are garnering brand new (and unexpected) attention. Sustainable-minded advancements in tires, fuels, oils, and vehicles (such as electric and hybrid) have already reached the cars at your local dealership. Therefore, it should be no surprise that professional race teams — staffed with top-flight engineers – are developing innovative and eco-friendly solutions. The top sanctioning bodies of NASCAR, IndyCar, and F1 are all getting their act together when it comes to reducing their carbon footprint. The largest of these in the United States are NASCAR and IndyCar. According to COO Brent Dewar, the NASCAR Green program has made “an industry commitment to demonstrate high performance racing with reduced emissions.” Both IndyCar and NASCAR encourage tracks and teams to reduce their environmental impact. Solar panel installation has resulted in some tracks, such as Pocono Raceway in Pennsylvania, to be 100 percent off the grid. And in California, Sonoma Raceway uses solar for power, sheep for landscaping, and even an organic garden for race weekend hospitality. 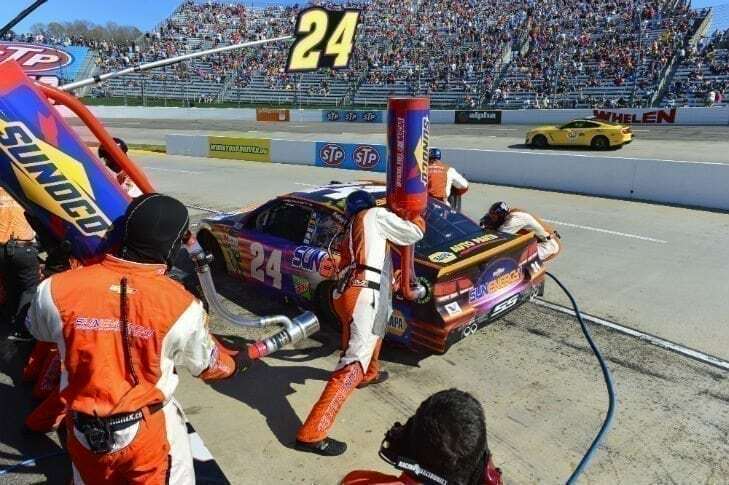 Some Race teams are following suit, recycling resources such as oil and gasoline, using solar and geothermal heating and cooling, and applying solar-powered generators to reduce CO2 emissions. In contrast, F1 cars run on gasoline very similar to what’s at the pump. The difference with F1 cars is their brakes, which run the Kinetic Energy Recovery System (KERS). This system stores energy to drive an electric motor to provide a horsepower boost to the gasoline engine. Lastly is Formula E, a division of F1, which has been campaigning for purely electric race cars, testing the limits of automotive energy technology. To the non-racing fan, cars driving around in a circle may seem like a simple endeavor. But in reality, it’s a real-world scientific testing lab right before your eyes. These exciting races showcase advancements in fuel, engine efficiency, kinetic energy capture, and electric motors and batteries that will eventually, and in some cases already have, become integrated into the next car you’ll be driving.